Interior Design's Pamela McNally (foreground) moderates the Sustainability Panel (from left): Interface's Chip DeGrace, Humanscale's Jane Abernerthy, and Design for Social Innovation's Cheryl Heller. Photography by Erik Bardin. Kicking off the afternoon session of the Innovation Conference, three design-industry leaders in social innovation, product design, and workplace design came together on the Interface Panel to discuss climate change and the value of sustainable design. 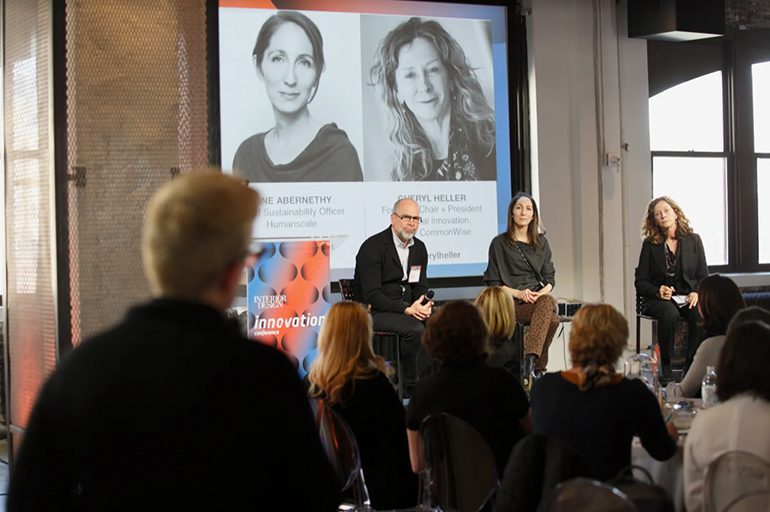 The panelists were Cheryl Heller, founding chair of the MFA program Design For Social Innovation at SVA and president of CommonWise; Jane Abernethy, chief sustainability officer at Humanscale; and Chip DeGrace, vice president of workplace application at Interface. DeGrace replied that it’s important to cut down embodied carbon in built spaces, which he plays an active role in enforcing at Interface. He explained how to measure the success of a built space from a sustainability standpoint. While certification can be helpful, it can also be expensive, and DeGrace mentioned a new online tool called EC3 that could help designers figure out which products will have a positive impact. Abernethy said she believes certification can be useful for providing a framework, but it shouldn’t be the end goal for designers. At Humanscale, she focuses on product lifecycle and net positive impact. Her team faces the challenge of sustainability by thinking outside of the box. For example, the Smart Ocean office chair incorporates recycled fishing net material. Beyond sourcing those materials, Abernethy stresses the importance of supplier relationships and supporting their communities. McNally turned the conversation over to the audience. Do clients ask for sustainable products? Do they push back if you suggest it? Some hands went up. Abernethy had another question: Do you know how to find a sustainable product? One or two hands in the audience went up. DeGrace and Abernethy agreed that lifecycle assessment can be helpful, but it’s the designer’s responsibility to push for change. “If you demand it, people will follow suit,” Abernethy said.